What did we all do for those ‘extras’ before the dollar store arrived on scene? Not only can you kit out your kitchen gadget drawer, but you can get really, really organized with tools and extras that you can buy at most any dollar store. Sure, you can buy these same things at a kitchen or office supply store, but if you’re just trying to get a little method into the madness, there’s no need to spend the big bucks. Go to any drawer in your house, whether in the kitchen, bathroom, desk or bedroom and you’ll likely come face to face with a mess. Various stationary items tossed in, a jumble of socks, makeup brushes and tubes rolling all over. Problem solved: little plastic baskets from the dollar store. They come in a variety of sizes, colours and heights, so that you can fit them into almost any drawer space and kill the chaos. This is particularly helpful for drawers that contain a lot of little items that tend to jumble together. The result of that is that you end up buying more pens, paper clips and other sundries, thinking you don’t have anymore when in fact you have a drawer full. For really small items, like earrings, you can pop an ice tray into your dresser drawer and keep them all neat and tidy, ready to pick up and put on. If you need a practical way to hang scarves, belts and handbags in your closet, why not get yourself a bunch of shower curtain hooks? They are perfect for the job and end up taking up a lot less space than hooks on the wall. Just set them up on your closet rod or on a wooden coat hanger and you’re good to go. Another great option? A clear plastic shoe organizer that you can hang on the inside of your closet door. All those little pockets just waiting to be filled with all of your smaller accessories or other items that you want to keep handy, visible but off the shelf and away from little kid hands, like your nail polishes! Craft boxes, with the sections and lid in clear plastic, aren’t just great for buttons or other crafting sundries. Instead, why not use them for hair accessories for the kids? Or what about their fabulous costume jewelry collection? Necklaces can stay untangled and rings and earrings remain where they can be found again! If you’re forever losing those elastic hair ties for the kids, get a metal carabiner and put them all on there, then hook it to the wall near where kiddo gets ready in the morning. They’ll always be within reach and you’ll be able to tell at a glance when it’s time to go to the dollar store and pick up a few more. Picture your pantry filled with food grade plastic canisters, for all your dry goods. Can racks with all your soups and canned goods organized by type. Plastic baskets for packages and boxes, grouped together by type. Looks dreamy, doesn’t it? Your fridge and freezer would benefit from this kind of organization too. Check out the linked posts on how to get that done, quickly and easily. Office tools in the bathroom. Bathroom tools in the entranceway. Pick up a mesh metal filing box or two and mount them on the wall in your bathroom. Now you have a safe place to pop the hair dryer or curling iron into, where they can cool off safely after the morning blast! If you can get your hands on some woven storage baskets, meant for paperwork or decor, you can fix these to the wall and have the perfect place for extra hand towels! Like floating shelves! Another great way to create more storage in the bathroom is to add a second shower rod, on the inside wall of your bathtub, and then hang plastic baskets from it with shower curtain hooks! Now you’ve got a place for bath poofs, shavers, and your salon shampoo—out of reach of kids but well within yours! A standard shower caddy makes a great holder for mail and keys, near the front entrance! Just give it a spray with a complimentary paint colour to your hallway and you’ve got an easy way to keep mail organized. Small plastic baskets, usually made to hold items in the bathroom, also make great places to store mittens and hats for each person in the house. Everyone gets their own basket, including the dog! If your kids have a lot of tiny toys—figurines, rainbow loom elastics, crafting supplies, LEGO—getting a job lot of clear plastic stackable bins with lids makes organizing it all a snap. One bin per ‘type’ of toy and snap on the lid. The kids can see what’s in each one without opening it and pick the right one for what they want to play with. This is also a great way to store medications for each member of the family, rather than keeping them all jumbled up together. Make sure to label those ones! Plastic ‘milk’ crates are cute shelving options too. They’re light enough to affix to the wall and use to store the families of stuffed animals currently living in your home. They can also be stacked on the ground and if they get knocked over? No harm done. And if your little one is into magnets, you can create a cool space for them to both store and play with them by attaching inverted pizza pans on the wall! Paint them a bright colour first, to match their room, and they’ll look like cool polka dots! If you find that toys travel in your house, place a basket with handles in a high traffic location so that as things are being picked up downstairs, they can be tossed in the basket on the stairs for each kid to take back to their room… and sort out… you hope. A bin filled with emergency supplies in the trunk is always a good idea, particularly in the winter months. Don’t forget that long road trips can be made simpler if you have an open basket with snacks that can sit on the seat next to the kids! It will keep most of it contained, instead of on the floor. And if you need smaller containers for holding things like crayons or playing cards (anyone up for Go Fish? ), why not get a plastic travel soap holder? It’s the right size and easy to store away. For car trips, the one thing you can always count on having is trash. Plastic cereal containers with the flip top lids make excellent portable and sealable garbage cans: just line with a bag and away you go! 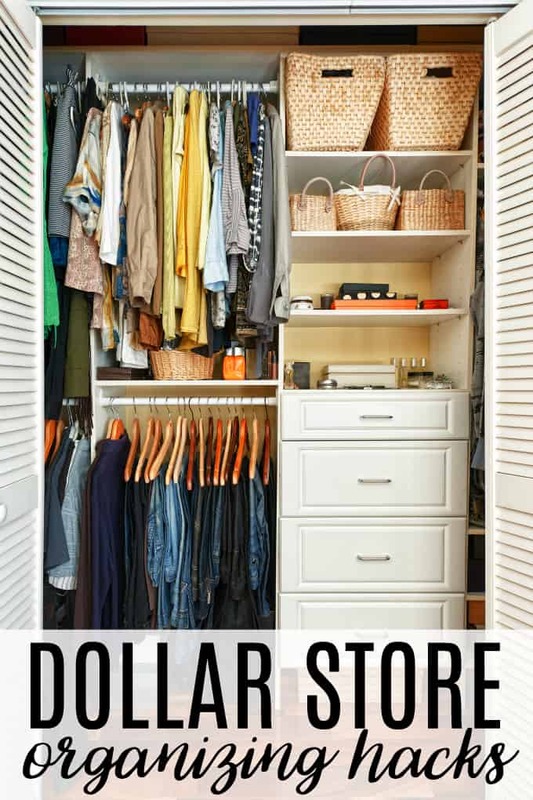 Who knew you could do all of this organizing with easy to find, affordable pieces from the dollar store? Do you have a favourite way to organize your home, with a dollar store item? Thanks a lot for these tips! Very helpful! You have some wonderfully creative ideas for organising various things, I actually have a second shower rod installed for extra storage – I saw that done at my daughters and copied the idea.